What is missing in the picture? The reason is not because it's left of , because as you can see in the second row it's also left of . The matrix puzzle starts with the first element, then adds each element once, and also resets the pattern to repeat itself. If you line this list in 6x6 matrix, it will look like the original puzzle. 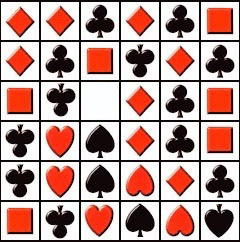 I found there are 1,2,3,4,4,6,7,8 of each suite and the number increases black,red, black, red, black, red so the second 4 should have been 5 of a black suit. 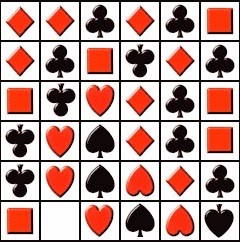 The two 4's were hearts and upside down clubs. So - upside down club.